Sitaizui, China — A new $1 billion four-season resort project is underway here about 230 kilometers from China’s capital city. Golf course architects at Golfplan are leading an international who’s who of development consultants in the planning, design and construction of Beijing Secret Garden that will ultimately include world-class ski facilities, a Whistler-style real estate/commercial community, and seven golf courses. Founded in 1993, Malaysian developer VXL Group brings a wealth of experience to the Secret Garden, mainly in the form of real estate, resort and casinos projects it has spearheaded all over East and Southeast Asia. Golfplan designed the publicly traded firm’s first golf project, 20 years ago — the Awana Genting Highlands G&CC, on the outskirts of Kuala Lumpur. Overall, Golfplan has designed 150 courses in 50 different countries around the world. 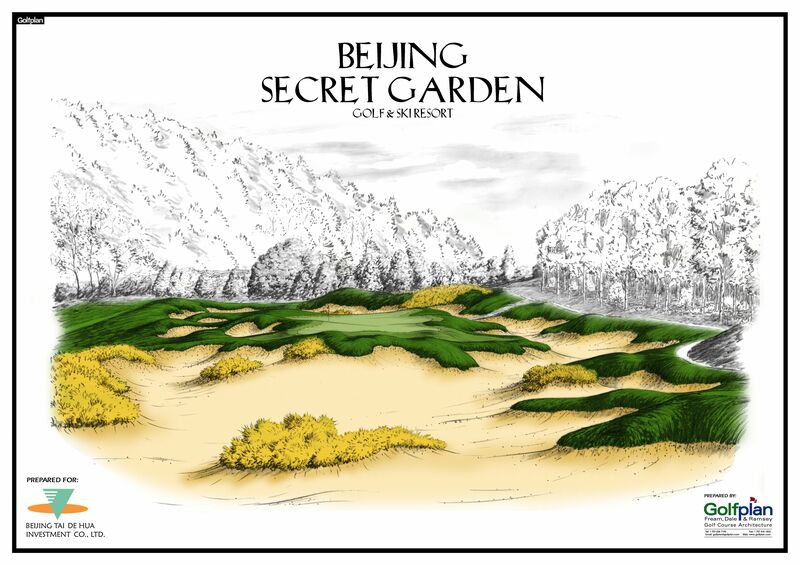 Golfplan’s internationalist outlook is matched by its colleagues on the Beijing Secret Garden project. VXL Group has retained vertical architects Hornberger Worstel, the firm responsible for the new W Hotel San Francisco and The Ritz-Carlton Lake Tahoe, alongside Ecosign, the mountain resort planners who crafted Steamboat Resort in Breckenridge, Colorado, Hanazono Resort in Hokkaido, Japan, and Whistler Blackcomb in British Columbia, Canada. Sasaulito, California-based SWA is responsible for the massive project’s sweeping landscape plan. “There are big plans for this property, obviously, and we’re eager to get the golf portion of those plans underway,” said Golfplan partner Kevin Ramsey, who anticipates breaking ground on the first course early in 2012. “This year, the concentration has been placed on resort infrastructure. Golf will follow quickly, but the scale of the project necessitates proper roads, reservoirs and electrical capabilities first. “The Whistler model is instructive. VXL Group has retained the ski architects who worked at Whistler. Massive infrastructure requisites are quickly falling into place. The Chongli region, home to Beijing Secret Garden, is 50 kilometers east of Zhangjiakou City, which was recently linked by the ZhangCheng Expressway. The Zhangjiakou Airport opened to commercial air travel this year, and completion of the Beijing-Urumqi High Speed Rail, in 2012, will further ease access making Zhangjiakou will be the first stop on this line. The focus of Beijing Secret Garden development is a valley that cuts through a dramatic landscape of mountains and broad grasslands. The Golfplan-designed course, the first of seven, will occupy either side of the main entry road, meaning it will be the first thing visitors see upon arrival. The Beijing Secret Garden project, where Golfplan is slated to design all seven golf courses, was surely procured on the strength of its recent work in China: Qiandaohu Country Club in Zhejiang Province. This new course was named the country’s top new course by China Golf magazine in 2009, while the spectacular Weihai Point Golf Resort, opened in 2010, in Shandong Province, has garnered numerous international course design awards.